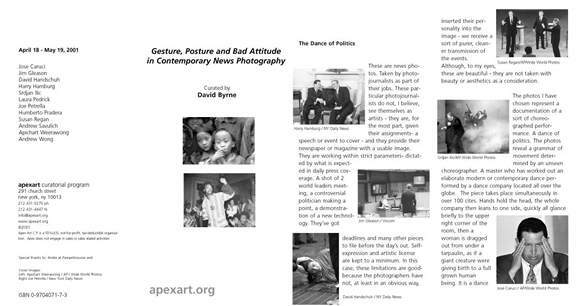 The exhibition featured large format digital prints of contemporary news photos selected by David Byrne. Photos from wire services, photo agencies and daily papers are chosen with an eye to the choreography of public figures and public gestures. These are news photos. Taken by photojournalists as part of their jobs. These particular photojournalists do not, I believe, see themselves as artists - they are, for the most part, given their assignments - a speech or event to cover - and they provide their newspaper or magazine with a usable image. They are working within strict parameters- dictated by what is expected in daily press coverage. A shot of 2 world leaders meeting, a controversial politician making a point, a demonstration of a new technology. They've got deadlines and many other pieces to file before the day's out. Self-expression and artistic license are kept to a minimum. In this case, these limitations are good- because the photographers have not, at least in an obvious way, inserted their personality into the image - we receive a sort of purer, cleaner transmission of the events. Although, to my eyes, these are beautiful - they are not taken with beauty or aesthetics as a consideration. The photos I have chosen represent a documentation of a sort of choreographed performance. A dance of politics. The photos reveal a grammar of movement determined by an unseen choreographer. A master who has worked out an elaborate modern or contemporary dance performed by a dance company located all over the globe. The piece takes place simultaneously in over 100 cites. Hands hold the head, the whole company then leans to one side, quickly all glance briefly to the upper right corner of the room, then a woman is dragged out from under a tarpaulin, as if a giant creature were giving birth to a full grown human being. It is a dance whose only documentation is in the photos assembled here. The idea of a hidden choreographer whose company is entirely politicians and newsmakers might seem to be some ridiculous invention of mine, but maybe there is another kind of truth revealed here. Maybe there is a preferred set of gestures for use in politics - a set of movements that are not written down or described in any book, instruction manual or party pamphlet- but are it nevertheless adopted by all who assign themselves to this profession. A series of movements which have evolved over the years, and continue evolving. Movements which obscure, obstruct, disguise and distract from the subject, from the text. Movements which say either what they mean, of exactly the opposite - sometimes the movements are the true content, and the speech or text is a mere distraction, a diversion. Just as singers have stereotypical moves and gestures, so do those whose profession is the art of politics. It is learned by studying one's peers, one's predecessors and countless hours of TV viewing. Viewing with a special eye - for the ordinary member of the public seems to be completely unaware, at least consciously, of the staging and work that has gone into their news programs. However, students of quotidian movement, dysfunctional neurologically damaged patients and now ourselves- are aware of the conspiracy. An aesthetic conspiracy so vast that even it's originators are no longer aware of its existence. The deception, if that is what it is, has even deceived the deceivers. Perfect. It is as it should be - even the choreographer, the artist, is charmed by his or her own work. All these images were taken with various kinds of cameras, a variety of film stocks and digital technologies, which have been processed in a variety of ways. Therefore, I have decided to put them all on a level playing field, so to speak. They have all been printed in black and white - although not all were originally taken that way. And they have all been printed, almost all of them, as the same size prints by Pamplemouse, the better to reveal their similarities rather than pointing out their differences. The differences are a distraction, which has been surgically removed, but only temporarily. As a side note I must comment that these images, most of which were taken over the last decade, reflect the transition from film to digital imagery in news collecting. It is, at least initially, a sad story. The rush to digital picture taking, while convenient, cheap and transmittable, is aesthetically inferior. Although digital film in a portable camera can take fairly high resolution images these days, these possible hi-resolution images take ages to process by the camera between shots - 45 seconds at the minimum the photographer must wait between shots! Not an option when a politician is gesturing or gunfire is involved. So the photographers opt for a faster lower resolution, more "compressed" image. but when blown up they just fall to pieces, and not in an always enjoyable pixel-like pattern. The prints made from 35mm film is far superior, but maybe took an hour more, at least to process, scan and transmit - so you do what you can, you can't always take the scenic route. To further accommodate this variety in the images we decided to print on newsprint, the same medium these pictures are intended to be viewed on. The paper, like any newspaper, will yellow - probably visibly by the end of this show. And soon after that will crumble and turn to dust.